Washington (CNN) — Federal health officials on Thursday are unveiling a $54 million national media campaign to get smokers to quit and prevent anyone else, especially children, from starting. The campaign, called “Tips From Former Smokers,” is intended to educate Americans about the dangers of smoking through the stories and graphic pictures of ex-smokers who have suffered severe health consequences of tobacco use. The former smokers profiled have suffered ailments such as stroke-related paralysis, limb amputation, lung removal and heart attack. One breathes through a stoma, a surgically created hole in the neck through which a person who has undergone larynx or voice box surgery can breathe. “Hundreds of thousands of lives are lost each year due to smoking, and for every person who dies, 20 more Americans live with an illness caused by smoking,” Health and Human Services Secretary Kathleen Sebelius said in a statement. The ads are the brainchild of the Centers for Disease Control and Prevention’s Office on Smoking and Health. The agency says smoking remains the country’s leading cause of disease and preventable death, resulting in more than 443,000 fatalities annually. More than 8 million Americans live with a smoking-related illness or conditions, according to the disease agency. The combination of public service announcements and paid advertising for television, radio, newspapers and magazines also spotlights the dangers of exposure to secondhand smoke. The ads will also be featured on billboards, in theaters and online — including on Facebook, Twitter and YouTube. The campaign includes eight television ads (one of them in Spanish), seven radio spots in 30- and 60-second versions, seven print ads and five billboard and bus stop ads. The campaign marks the first time the CDC has run a paid, comprehensive national anti-tobacco advertising effort. The primary target is smokers ages 18 to 54, but public health experts also said they hope it will dissuade children from adopting the habit. While we are not prepared to comment … discouraging smoking initiation and promoting quitting remain important. The need for such a campaign is urgent, according to the Campaign for Tobacco-Free Kids. The CDC said the tobacco industry spends more than $27 million a day on marketing to kids and others — about $10 billion a year. In two days, the industry spends about what the government has budgeted for the entire 12-week campaign. The industry denies that it markets to children. Not in dispute is the deadly impact smoking can have on health. About a third of the smoking-related deaths in the United States are linked to heart disease, according to the American Heart Association. The ads highlight a shocking but very realistic fate. “The ads highlight a shocking but very realistic fate that could await some current smokers if they continue their tobacco addiction,” said Nancy Brown, the association’s CEO. The ads note that smoking contributes to one in five strokes and increase the odds of having a heart attack. “The American Heart Association believes these graphic ads, coupled with vigorous tobacco control at the state level, will reach not only the adults who smoke, but also will break through to teens and discourage them from ever taking up this deadly habit,” she said. 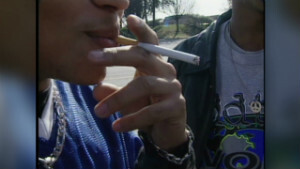 The American Cancer Society says nine of 10 smokers started before they turned 18. Featured reader comments: Should smokers be targeted? The campaign begins less than a month after a federal mandate requiring tobacco companies to place graphic images on their products warning of the dangers of smoking was tossed out by a judge in Washington, who said the requirements were a violation of free speech. The Family Smoking Prevention and Tobacco Control Act passed in 2009 would have required nine written warnings such as “Cigarettes are addictive” and “Tobacco smoke causes harm to children.” Also included would have been alternating images of a corpse and smoke-infected lungs. CNN’s Caleb Hellerman contributed to this report.